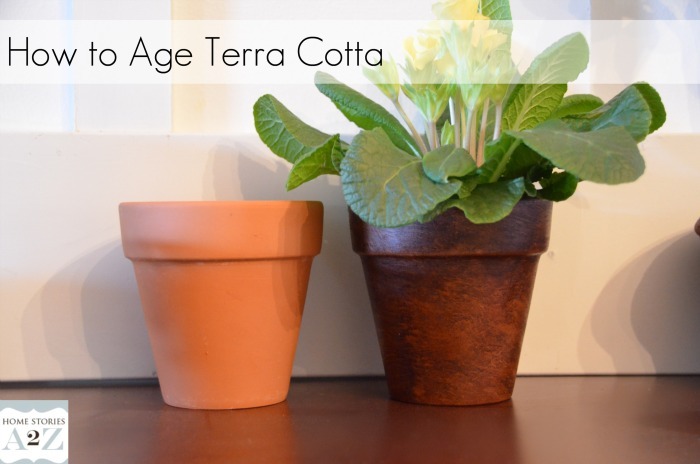 Today I thought I’d share a quick tip on how to get an aged look to your terra cotta pots using dark furniture wax. I used this technique recently when I created my Valentine’s mantel and loved the results so much that I’m attacking any terra cotta in my home with wax :). I’m not a fan of the orangey color of terra cotta, and the stain provides a rich worn look that I’m digging. All you need to achieve the look is some dark furniture wax, a brush, and some paper towels. 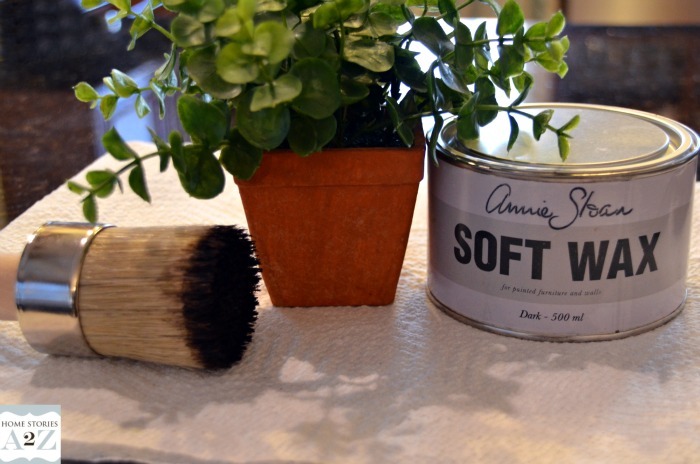 I happen to have Annie Sloan’s Dark furniture wax on hand, but I think any dark wax would work. 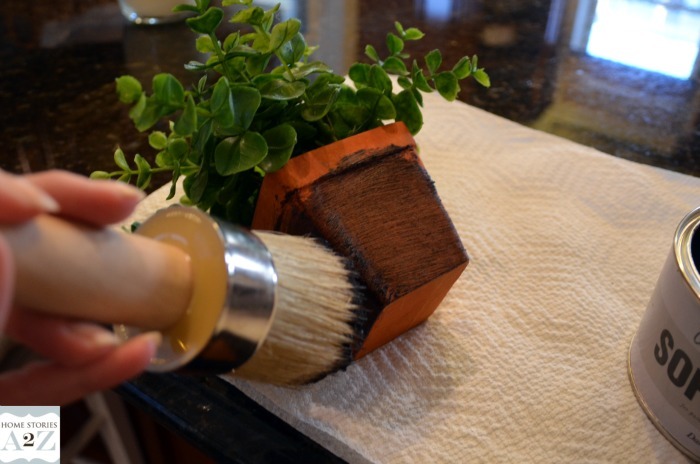 Using your paint brush (or wax brush if you happen to have one), rub the furniture wax into the terra cotta. I like the look of the brush marks, so I make sure that I apply the wax using even brush strokes in the same direction. 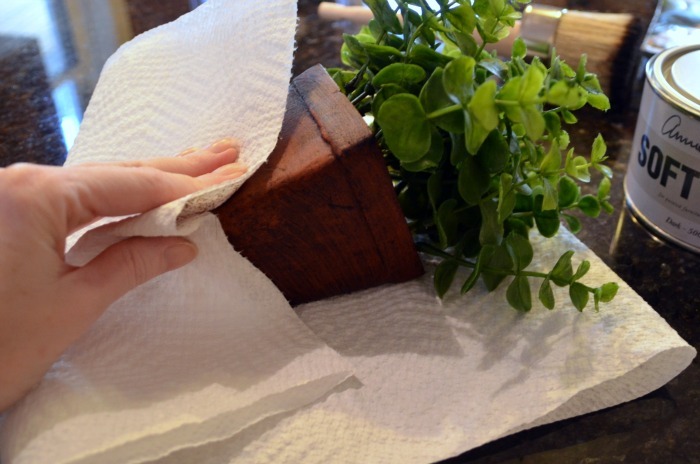 Once your pot is completely covered, use a paper towel (or old rag) to wipe off the excess wax. That’s it! 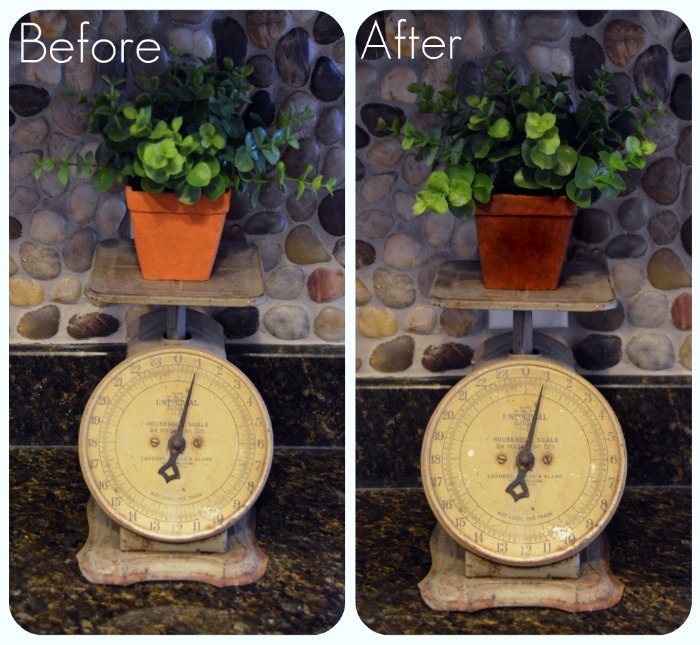 Here is the before and the after–a darker, richer terra cotta that looks fantastic! Enjoy! I agree, The colors of plain terra cotta is not to my taste. I love the worn look, I will be doing this! Thanks for the idea! What a great idea! I love the patina on these pots and I never knew it could be so easy to achieve that look. Thanks for sharing. Love this Beth and I have just the pot to try it on! I love it! I will definately be doing this soon. Beth, these pots are fab. I love the finish, I am for sure going to try this. P.S. The old scale is so cool! Now, if someone would just figure out how to get a bit of a mossy look, too, I’d be set! Love the patina these take on, Beth. Thanks for sharing! Beth, these look awesome! Plain old terra cotta is not my favorite–but paying for expensive pots is not my favorite, either. Last year I came up with a way to make faux “aged” pots (you can see that post here if you like: http://www.impartinggrace.com/2010/08/inspired-by-pottery-barn.html) but my method takes a little while and requires spray paint, so it’s not a great project for winter. Yours look great and could be done any time! BTW, thank you for actually showing the products you used. I’ve wondered where to buy wax since it’s obviously such a great tool. I need to look into Annie Sloan products. Usually I’m in to galvanized because of the orangie terra cotta, so I will be giving this a try asap!!! This is so easy and the results look fantastic. Thanks for sharing your techinque. How convenient! I just bought some AS dark wax! Yay! where did you buy the wax? I am having a hard time finding – looked at Lowe’s and Home Depot – no luck. Love this idea. So simple, yet makes a big difference!